At the Sharp End covers the harrowing early battles of World War One, when tens of thousands, then hundreds of thousands, died, before the generals and soldiers found ways to break the terrible stalemate of the front. It provides both an intimate look at the Canadian men in the trenches and an authoritative account of the slow evolution in tactics, weapons, and advancement. Featuring never-before-published photographs, letters, diaries, and maps, this recounting of the Great War through the soldiers’ eyewitness accounts is moving and thoroughly engrossing. 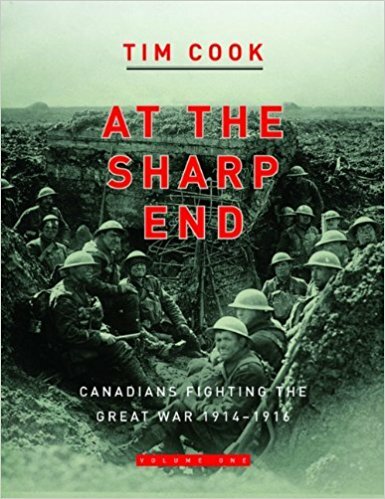 At The Sharp End is the first comprehensive history of Canadians in World War One in 40 years. Personnel at the temporary office of the 8th Field Squadron, Royal Canadian Engineers (R.C.E. ), Calmpthout, Belgium, 23 October 1944.